Enhance your smartphone photography with the Moment Wide Lens. This lens features aspherical glass that lets you capture twice as much in your shots of groups, landscapes, and architecture. The metal body keeps it safe and the twist-lock mounting mechanism works with Moment Photo and Battery Photo cases. A lens cap and microfiber bag are included. Box Dimensions (LxWxH) 3.7 x 2.9 x 1.75"
Wide Lens is rated 4.6 out of 5 by 31. Rated 5 out of 5 by Evren from Really impressed I cannot say that I was expecting a mediocre quality product when deciding to pay the price for the Moment Wide Lens. I was still very positively surprised about the optical quality as well as the look and feel of the lens. This lens should not be confused with the Moment or other brand fisheye lenses, since with this one, what you get is a proper wide view without the spherical distortion (which is certainly normal with fisheye lenses). I'm now asking myself if my good old iPhone 6 is good enough for this great add on. Well done Moment! And thanks for the pleasant shopping experience as always B&H. Rated 5 out of 5 by Shayne from A fantastic lens for your iPhone worth every penny. I have been using the iPhone for many years and have also purchased accessories / lens attachments from other brands (Ollo Clip) to use with the phone but this by far has to be the best lens add on i have ever purchased and together with the moment case, it is super convenient. The images are super sharp but there is a bit of flaring in the images shot in daylight which is very minimal. Rated 5 out of 5 by James from Great Option for Mobile Photography I'll start by saying that the build quality of this lens is great. Images from my Pixel 2 come out incredible and the extra width really helps during video recording as the Pixel 2 is well known to have a VERY narrow view during video due to the stabilization methods. In addition, the lens is HEAVY. I've never weighed it, but it seems to be as heavy as my phone itself, so it is built solidly. It is easy to attach with the lens case and I also got the filter adapter which works great. With this lens in hand, I've generally gone to using my Pixel 2 as my utility camera for day time action photos or landscapes. My SLR is still with me, but is generally reserved for telephoto or astro. One last note, this lens helps bring in a little extra light in low light situations. I've given astro a try with my Pixel and this lens and it works surprisingly well. Still, not as good as my larger SLR, but pretty impressive what a phone can do these days when mated with good glass. If I had to pick on anything, it's that the lens does not come with a backside cap. There's a large cap for the from of the lens, but the mount side is exposed. I ended up making my own cap for the mount side as I didn't like the idea of it being exposed, but would have been nice if it came with one. Rated 5 out of 5 by Andrea from Great Little Camera Lens After reading reviews, I decided to but this Moment Lens for my Samsung Note 8 for upcoming travel. With the case it hooks on easily with no fear of it coming off. Image wise, the glass used is high quality and heavy. I no longer have to suffer figuring out ways how to capture a wider image. It has been great for travel when I don't want to carry a heavier camera. Easy to use and the images it helps create are stunning. There is a bit of lens flare in certain situations where the sun is bright however I am sure Moment sells accessories for this. Rated 5 out of 5 by Debbie from The perfect gadget I bought this right before I went on holiday and was very impressed. The images were sharp. It's now a permanent part of my iphone now! Rated 5 out of 5 by Suneil from Great accessory if you have a case for it I happen to own a Nomad case that was moment lens compatible with my iPhone Xs. I use a Nikon D4 for a DSLR, so Im pretty picky. But I am impressed, gives great visual options when using my iPhone on the fly. For dedicated photography Ill still stick with my D4. I may consider their tele lens too if it goes on special since I already own the case...note the Moment app allows you to manually adjust which Lens on the iPhone Xs and what ISO, aperture, and shutter speed you desire. Woah! 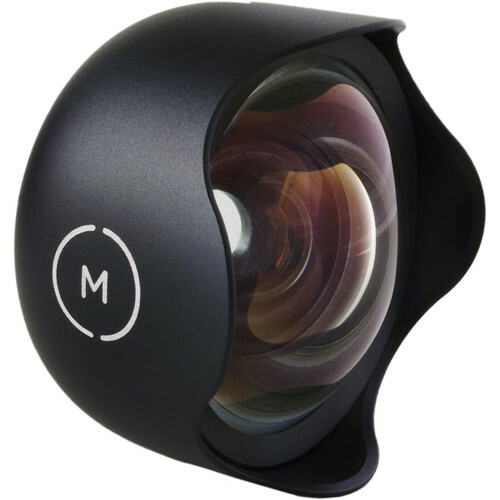 Rated 5 out of 5 by Mark from Expand Your Field of View This lens is a cool way to get more out of your iPhoneX camera. Just recently started getting serious about capturing video with the iPhone. And this lens is a perfect fit, especially in it's capacity to expand the field of view when it come to shooting video with the Movi Freefly. Rated 4 out of 5 by Wendell from Best Wide Angle Lens for my cell, but.... Taken on its' own, the Moment Wide Angle is the best W.A. lens I've found. Period. But.... The available cases to mount it to your phone are limited to the latest from Samsung and Apple. No problem for my 9+, but my dedicated cell for my DJI Osmo Mobile is a Galaxy S5, and mounting the 9+ with the Moment lens requires a $35.00 counterweight. Plus, the Moment cases with the bayonet attachment for the lens is now plastic, and the very first time I mounted it, the lens bayonet, which is metal, shaved a piece of the case. I don't expect this become a real problem for several years, but in the meantime, I am searching for 3D printer plans to print up a case with this mount for the S5, also. It is worth mentioning that a friend who does videos for high end home sales uses the Moment with his iPhone, and while initially surprised by the apparent consumer grade outfit, his clients have been very impressed with the end product visually, which matches his shooting and editing skills, to make a superb end product. If I were advising Moment, I would suggest they partner with Otter Box cases, to put bayonets on the Otter Box line, such as the Defender case. Otter has a much more varied lineup of cases, and the potential to sell a greater number of lenses. That, and, maybe mold a steel bayonet flange into the case. In case you haven't guessed, the case is the reason for 4, instead of 5 stars.